Rare Royal Doulton Motoring Plate. 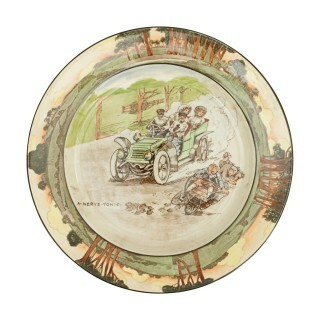 An early Royal Doulton automobile plate entitled ‘A Nerve Tonic’. The plate is in excellent condition with no chips, cracks or repairs, there is the usual crazing to the glaze as would be expected. The plate depicts two boys on a go-cart tumbling out of the way of a car with the caption ‘A Nerve Tonic’. 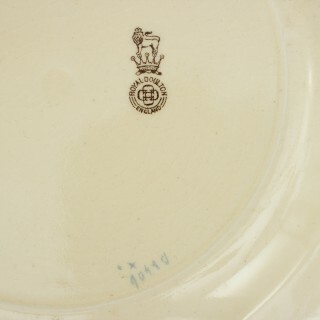 The plate has the printed Royal Doulton trademark, Royal Doulton with the lion and crown, and the pattern No. D2406. 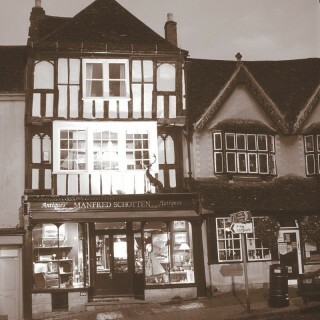 This particular trade mark was introduced to mark the grant of the Royal Warrant by King Edward VII. We do have two other Royal Doulton automobile plates available. The price above is for a single plate. 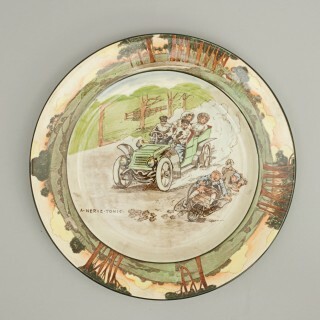 The Royal Doulton “The Motorists” Series by George Holdcroft had six plates in it, each decorated with veteran motoring scenes. The series was introduced in 1905 and withdrawn by 1928 and comprised of ‘Room for One’, ‘Blood Money’, ‘Itch yer on Gov’e’nor?’, ‘A Nerve-Tonic’, ‘Deaf’ and an untitled plate which showed a Yokel & two motorists outside the Chequers Inn. Excellent, only the usual crazing to the glaze.